Stored Procedure is one of my favorite database objects in Microsoft SQL Server. In Data Processing Continuum, SP is more near to Data then view or batch. Moving nearer to data for good performance and data integrity is a rule of thumb in SQL Server. Creating your logic in Stored Procedure is not only improving performance and integrity but it reduce the network traffic as well because you are not making logic in client application but making it in SQL Server itself. Anyway, let us now focus on our core topic of the article. 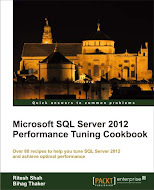 –SP are compiled object so it is anyway fastest than batch or T-SQL query. –Provide consistency as you can use one stored procedure at many places in client application and at the time of modification all you need to do is, change at one place and you will done. –provide abstraction layer and security as it hides the table name. Why is it boosting up the speed? Answer is quite simple as I described earlier is, it used to compile the Stored Procedure at first run, creates query plan for that and store it in memory so than repeated use of same stored procedure can be freed out from the burden of creating query plan. You can see stored query plan with following query in SSMS. Note: below query will show you all compiled plan stored in system, not only those who are stored via stored procedures only. Be aware that, all the plans for stored procedure will not stay forever in syscacheobjects. It will obsolete when any index, on the table we have used in SP, is created/ dropped or big data manipulation performed on the table. However, you can mark your stored procedure as recompiled by following command in SSMS. There are mainly three commands to manage stored procedure. ALTER, CREATE and DROP. –after creating SP,let us check whether it actually works!!! I will provide you with more examples with complex structure of stored procedure very soon.